Atlantic Water Treatment Technologies wants to help you enter the self-serve, Bottled Water business! When you set up a dispenser, you will be promoting your own store. You will realize a return of at least 90% profit per gallon. Self-Serve, forms habits as customers return regularly for refills. We will help you to run a line to your coffee machine, bakery, deli, ice maker, kitchen, photo finishing or misting equipment. This is a very powerful environmental enhancement that will bring your store’s image to the forefront. It’s the freshest purist safest water available, because it is made daily. The most popular bottle sizes are ready to be filled and easily handled by all age groups. Consumers fill as required and are not tied into inconvenient delivery schedules. 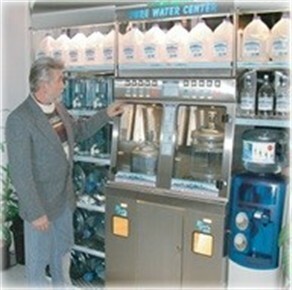 You can provide the very best prices for pure water. Reverse osmosis is recognized as “what to buy” when purchasing bottled water. It is also recognized for its purity and It comes from a known source. #1 in Canada. E – Max the most hygenically safe water dispenser on the market. The following dispenser, is an attractive stainless steel unit with plexiglass doors enhanced with florescent lighting. This unit will look great in any store attracting your customers to take advantage of your self-serve bottled water factory. Your customers will be very grateful to have a bottled water store in their neighbourhood or proximity. This Single Automatic Dispenser is filled with features that benefit both the consumer and storeowner. Automatic bottle filling is provided through our unique PLC control system. 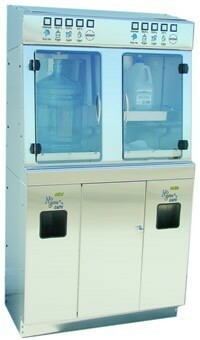 The Dispenser is designed to fill the most popular bottle sizes requested in the Self-Serve market. Made for the Self-Serve market, the Single Manual Dispenser is an economically priced market entry product that will give years of trouble free service. The Single Manual Dispenser is ideal for a small-medium size retail store. This unit is ideal for a small store taking up very little space yet allowing your customers to access a never ending supply of fresh demineralized water through the reverse osmosis process. In addition to the single dispenser unit for small retail outlets, Atlantic Water Treatment Technologies, offers double or more dispensers larger bottled water plants, as well as a connection to accessories as bottles, water cooler sales etc. This has the potential of a whole new line of products. Looking at starting a large scale delivery business? A water purification system such as reverse osmosis, is located in an “out of the way” area of your business. The water is piped directly to your “in store dispenser”. You will always have the benefit of support from Atlantic Water Treatment Technologies. We are located here in the Maritimes and our technicians are trained to respond to any concerns you might have. We are available by phone email or, if necessary, in person, to help you with any needs which might occur. In these unsure economic times, water is one product which will always be in demand. Your bottled water factory produces water at a cost to you of pennies which you resale for dollars.